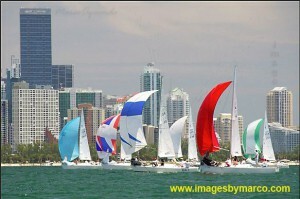 The Florida State Championships were held in beautiful Miami, FL the weekend of July 16th and 17th. The regatta was hosted by Flat Earth Sailing and sailed out of the Olympic Sailing Center. 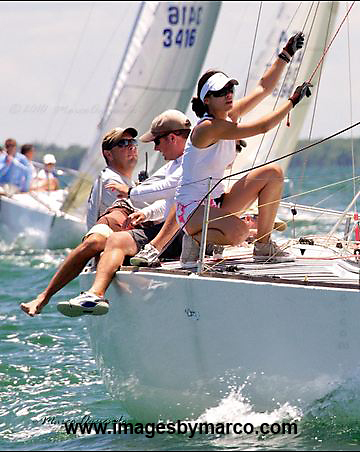 Saturday’s racing started on time at 12 pm with a building east southeasterly all day. The wind held a little more east of southeast as it built which is somewhat atypical for the venue which caught some of the seasoned Biscayne Bay sailors off guard. Robby Brown from St. Petersburg had a good day with Mark Liebel and John Poulson mixing it up at the top all day. At the end of the day, USA 799 with Robby’s team suffered an OCS and would have to hope for a fifth race to count it as a drop. This left Mark Liebel’s team aboard Supernatural Fishslapper holding the lead with John Poulson close behind going into day two with Robby having no margin for error. Sunday brought more atypical Biscayne conditions as the wind held out of the west for three races. This direction provided for some very shifty air and challenging conditions with positions changing frequently all day. Dmitry Yakovenko’s team sailed a great day to recover from a tough day on Saturday. In the end, Robby Brown was able to drop the OCS from Saturday and post the most consistent score line averaging less than third. Close behind in a hotly contested race for third, Mark Liebel beat John Poulson on a tie breaker to finish second. Behind Poulson in fourth was local Miami sailor Lionel Baugh who sailed a great series to finish just three points behind Liebel and Poulson.